As I rushed out of the house at 9:00pm last night on the way to the hospital, I didn’t think to take a Bible with me. By the time it crossed my mind, it was too late to turn back for it. How could I not grab my Bible!? Ugh! Stopping to fill the car with gas and grab a coffee for the long night, I sent a text to some brothers in the faith asking for prayer. My phone almost dead and my access to a digital Bible thus limited, I had no written Word of God to take with me so I also asked for some Scripture to share. Praying for the 45 minute drive downtown to comfort a friend in his hour of need, I asked God to reveal to me what to say. I asked for SO much in that time. I asked…and asked…and asked some more. I praised, and I glorified. I sought Him, and I sought His Word. I sought to recall it, knowing I would have to rely on my weak memory alone to speak Truth into the lives of a family hurting in the dark hours of the night. Stepping out of the car at the hospital, I looked at my phone, on its last minutes of battery life, to see the texts from the brothers praying for the situation and the various Scripture references they pointed me toward. And I prayed, “if only I had a Bible with me.” In that instant, it’s as if God whispered directly in my ear “look in the back seat.” Finding NE’s children’s Bible, I laughed and praised God for it…and then walked inside. Isn’t it awesome how He provides exactly what we need when we need it! Hours later, as midnight approached, I opened it and read through some Psalms. In turning to find what I was searching for, I turned too far and landed right dab on Proverbs 15, and this. This. 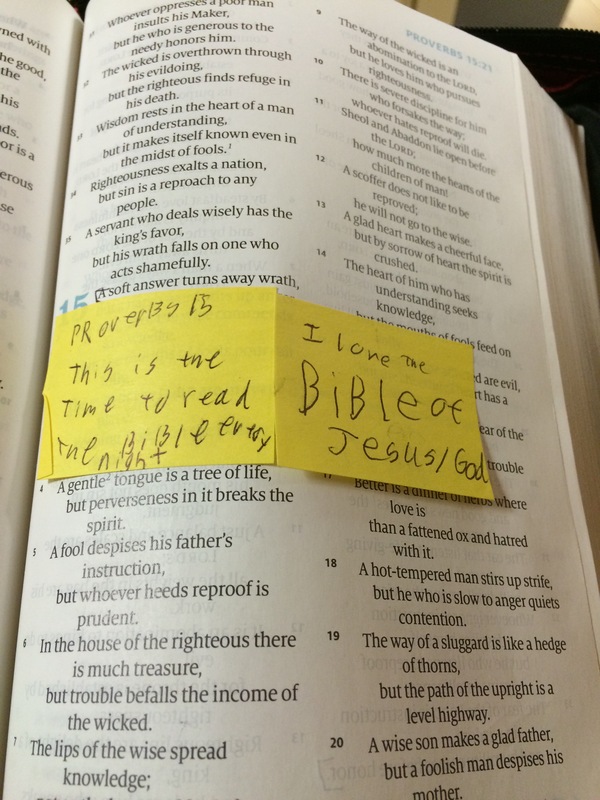 A post-it note written by my son in his newfound faith, as he seeks to know his God better…seeks to know the Jesus that died for him in a deeper, more intimate way. This was the calming voice I needed to remind me that I don’t have to have all the answers when life happens. Because I don’t. And I never will. But I know who does. He’s the Jesus/God of the Bible. And I love Him …and His Bible! Thank you, Lord, for speaking to me through my son. And thank you, son, for being faithful in your quest for Him. In your youth, you are witnessing to those around you (i.e. me) more than you know. Lord, help me lead him and his brother in YOUR ways. Help me to die to self so that I may live for you. Guide me as I guide them. Let them see you in me, and let them follow you, not me. The enemy is real. 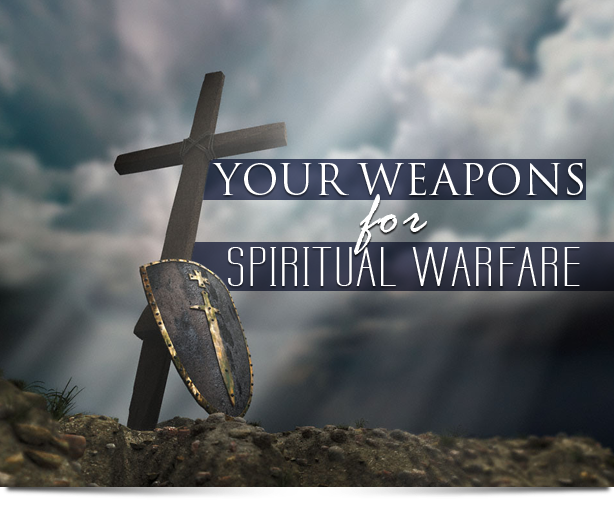 The battle is real, and though we only see the battle from our earthly perspective, it is spiritual in nature, and it wages nonstop for our heart, mind, body and soul. All around us, the devil and his demons are trying to penetrate our defenses and gain a foothold. The earthy walls we put up to defend ourselves are powerless to defend us. They serve only to shield us from reality…to isolate us from the world around us. If the battle is a spiritual one, then the walls we must put up should be spiritual as well. Get up and face the battle…don’t run and hide. Gear up and man up. Put on the Helmet of Salvation, the Breastplate of Righteousness and the Belt of Truth. Slip into the Gospel Shoes and pick up the Shield of Faith in one hand and the Sword of the Spirit in the other and claim the victory in Christ’s name. You’re His child and your destiny is sealed in the Book of Life. Go claim the victory. Go. Go now. Coming off a 72 hour firehouse shift, I’m headed from one job to the next…go go go. Gotta get my laundry cleaned. The trash needs changed. The carpets need cleaned. The yard needs mowed. Need to clean and organize the garage. It’s time to start closing the pool for the winter. Gotta pack for a mission trip. Need to make sure the ministry team is equipped and ready to keep rolling on while I’m gone. The tags on the truck expired last month; can’t find the paperwork I need I renew them, so I’m off to spend the morning downtown getting all that in order before I spend another full day at the office…answering emails, returning phone calls, scheduling, budgeting, shuffling equipment. Gonna run home this afternoon and get there just in time to meet the school bus and cram some food down their throats on the way to practice…gotta shuffle Kenpo and soccer practice into one night and still find time to do some homework with them. When it’s all said and done, maybe bath time will go smoothly enough to get some lap time with their favorite book before bedtime prayers. When it’s all said and done, I’ll crash in a heap of exhaustion on the bed and lay there letting the frustration build as the boys are restlessly up and down, in and out of bed. Just. Fall. Asleep already. As exhausted as I am, my body and mind are telling me to sleep for a week. Yet, I’m restlessly running tomorrow’s to-do list through my mind, wondering how I can jam just one more thing into the schedule. No wonder the boys won’t fall alseep. They can’t. Can I blame them? Neither can I. Ugh. So here I am. Sitting on the side of a busy street, intermittently looking up from my typing to watch the world go by. Three guys just walked past me. The first was talking on the phone, the second was reading some papers as he walked, and the third was shuffling through a binder filled with papers, literally tripping over the sidewalk as he continued on without slowing down or taking his eyes off his paperwork. Busy busy busy. Nonstop really. But why not call on these gods you have made? When trouble comes, let them save you if they can! For you have as many gods as there are towns in Judah. Why do you accuse me of doing wrong? You are the ones who have rebelled,” says the Lord. “I have punished your children, but they did not respond to my discipline. You yourselves have killed your prophets as a lion kills its prey. Does a young woman forget her jewelry, or a bride her wedding dress? Yet for years on end my people have forgotten me. “How you plot and scheme to win your lovers. Even an experienced prostitute could learn from you. Your clothing is stained with the blood of the innocent and the poor, though you didn’t catch them breaking into your houses! And yet you say, ‘I have done nothing wrong. Surely God isn’t angry with me!’ But now I will punish you severely because you claim you have not sinned. While this passage was directed at Isreal, it certainly hits home for me and the busyness I’ve allowed to creep into my life…my family’s lives. My words and heart say I don’t chase other gods, but my actions often say otherwise. God says. 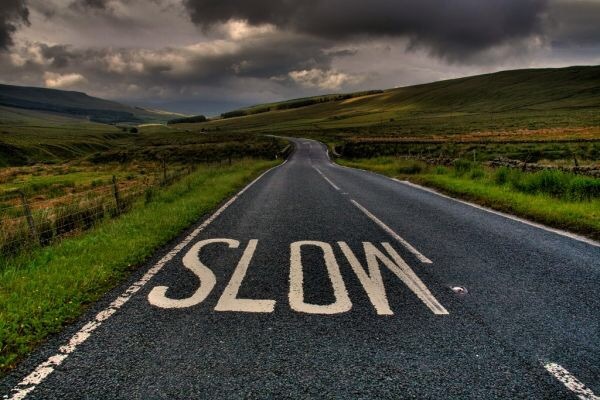 Just slow down. Lord, I’m sorry. I turn from the gods I chase after here and toward You. Draw me in, oh Lord my God, and quiet my soul. Draw near to me and fill me with Your presence so that I can rest in You and lay the toil of this life down at the cross. Abba Father, thank you for never giving up on me…for bringing my shortfalls to my attention and allowing me the opportunity to continually come back to You. I’m a work in progress, Lord, and as long as You give me breath to live I will seek to become more like You everyday. Though I fall woefully short, You pick me up time and time again and bring me into Your arms. For that I only know to cry into Your shoulder and weep aloud, “thank you.” Thank you, Lord, thank you. Amen. That’s my prayer for you as well. Prayerfully, there’s still time in this life to show you better how to slow down and rest in God. The human body has many parts, but the many parts make up one whole body. So it is with the body of Christ. Some of us are Jews, some are Gentiles, some are slaves, and some are free. But we have all been baptized into one body by one Spirit, and we all share the same Spirit. I am too often consumed with serving God, wrapped up in the details of a to-do list, that I am focused on the wrong things. Too often, the blinders come on, the tunnel vision sets in, and I see only what’s right in front of me…a to-do list. I’m much too task-oriented when I should be relationship-oriented. My Kids and Oxen…Getting Dirty. Yes, I Went There. Planting, sowing, tilling and harvesting a crop is dirty work. And yet, we are called to it…put here on Earth to reap a harvest for God’s kingdom…to bring Him glory in everything we do…to point the lost to Him. Spoiler alert! The lost aren’t generally in the most pristine and cleanest of places (by our standard of clean anyway). In actuality, our first priority in reaching the lost should be in our homes. As parents, we’re on the front lines doing battle to win the hearts and souls of our precious little ones for God. And make no mistake moms and dads…it IS a battle. A battle that takes place both in the spiritual realm between God’s angels and the forces of evil…and a battle that takes place in the physical realm between us and the influences a fallen world has on our children. As we seek to hold our children close long enough to instill in them Godly character and moral truths, Satan is working overtime through the world around us. He is working to pull them farther from our reach into a cycle of sin that can only be broken when they truly realize and accept their brokenness and complete dependence on God. Dads, as a father of three boys and a special needs girl, I can assure you that raising kids is messy work. I get it, I know. It’s emotionally cluttered and chaotic…littered with drama. Drama we don’t like and would just assume avoid every chance we get. I mean honestly guys, who among us wouldn’t “rather be fishing”? Fatherhood is heavy-laden with emotional turmoil and baggage that wears us down…leaves us inpatient and unkind. It’s scary and often times traumatic. It’s heartbreaking and gut wrenching. It’s late nights and early mornings…with sleepless nights in between. And that’s just the emotional side. You WILL one day wake up to a clean house with no laundry to wash, no dishes to clean, no floor to mop, no bathroom to sterilize, no toys to pick up. No giggles to enjoy. No children to play. For the dad reading this. You wanna make an impact in your kids’ lives? Don’t let mom be the one to do all the dirty work. Let’s man up and get in the trenches with her in managing the homestead, eh? Because like it or not, we are right where we are called to be…whether we’ve fully accepted the role or not. Do you see it? To get an ox to plow the field and do the work that’s hard, it has to be trained. The ox doesn’t become strong after one planting season. It takes many seasons to develop its strength. 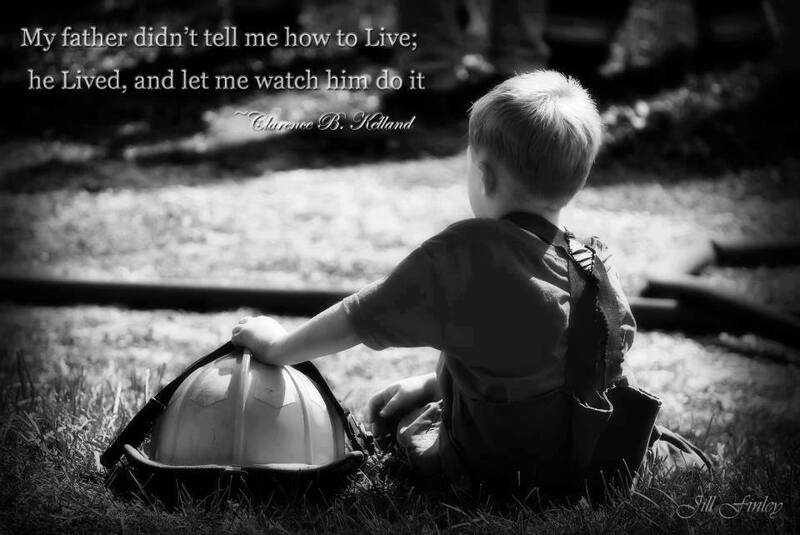 It has to be trained, and then only after years of training is it strong enough to do the work well. Much like an athlete who has spent years training for his sport, the ox is stronger for having endured the training. Likewise, our kids are being trained. Are we training them for the work God will soon call them to? Or is the world training them to resist Him? Are we preparing and equipping them for success on the front lines for God? Or is the world preparing them to rebel against Him? As dads, we have to be on the front lines in the mud with them (mostly figuratively, though many times literally). We lead from the front, not the back. To win their hearts and minds, we have to be involved. Engaged. Committed. Standing steadfast and consistent. Intentional in our actions and words. Every. Single. Day. Without fail. There are no breaks in fatherhood. What we’re called to do isn’t easy, by any definition. We’re being asked to work in the mess without getting messy. To work the field without getting any of the field on us. To be in the dirt without getting dirty. How is that possible, you ask? Only by the power and grace of a God who loves us enough to get messy for us. It’s by the blood we’re kept clean and holy. Even when we fail. It’s by the cross we are found pure in God’s eyes. It’s by the Son we can do all things. I’m gonna go jump in the dirt. Who’s with me? Are you old? I know I am. Well, at least SI says I am. I guess to a 4 year old, 40 probably seems ancient. It seems that lately there hasn’t been a day pass without me having felt my age more so than ever. Sore after doing routine tasks that shouldn’t leave me sore. Tired. Slow. Aching bones crying out for rest. Joints popping. Hearing loss. Trouble seeing clearly. Memory fading. Grey slipping in where it wasn’t there yesterday. The man of my youth is fast escaping me. I’m certainly not standing on death’s doorstep waiting for a final push into the grave, but there are definitely more and more days that I feel my age. Satan sure is good at his job of pulling us away from our relationship with God isn’t he? Thoughts seem to invade my mind occasionally that challenge my desire to keep moving forward. Some days it’s all I can do to roll out of bed and face the day. I wonder sometimes what difference for God’s kingdom I’m making. And though I’m still a young 40, I’d be lying if I said that my age never played a role in those thoughts and questions. Because on occasion they do creep in there. I imagine that’s even more true for someone in his 50’s. 60’s. 70’s. 80’s. 90’s. If we’re honest with ourselves, it can be overwhelming some days. Can’t it? Don’t be overwhelmed. There’s encouragement in the Word. John 15:5 says we can do NOTHING without Christ. When we abide in Him and allow Him to abide in us, we bear fruit. And this brings the Father glory, when we bear fruit (John 15:7). The fruit we bear for God comes in two forms: 1. Leading the lost to Christ; and 2. Living out and exemplifying the fruit of the Spirit found in Galatians 5:22 (love, joy, peace, patience, kindness, goodness, faithfulness, gentleness and self-control). Regardless of your age, if you’re not bearing fruit maybe it’s time to reevaluate your relationship with Christ. Are you abiding in Him and allowing Him to abide in you? Are you seeking Him with EVERYTHING you have? If you are, you’re producing fruit and are vital. Regardless of your age, as a child of God your assignment here is significant. You play a key role. Your life story is meaningful. You have a purpose that is important to God. You are critical to the mission. Crucial to the operation. Fundamental in achieving God’s purpose. Important to the team. Indispensable to God. An integral part of His plan. Don’t ever lose sight of that truth! I recently heard a six-year old on NE’s baseball team say “I know everything there is to know about baseball because I’ve been playing for three years already.” Well, I suppose when you’ve been doing something for half your life, you should know a lot about it, right? Too funny. 🙂 The reality is…we’re never too old to learn something new. If you’re alive in Christ, you’re green. What’s that mean? When a plant is green, it’s growing. As a child of God, you’re green when you’re growing. Being nourished by the Word. Cultivating relationships. Thriving. Stretching beyond your comfort zone. Maturing in your understanding of wisdom and truth. Flourishing in your faith. Developing the attributes of Christ. If you’re reading this, you’re not dead yet. Go live. Better yet, go be alive in Christ! Our God is faithful and just, is He not? Is He not worthy of our constant praise and adoration for that…and so much more? As a believer in the One true God, our strongest desire should be to declare His glory in ALL things. I might be old to a 4-year old, but I’m not on my death bed yet. You can rest assured that when I am I’ll be singing His praises and giving Him glory! For as long as I have breath, I’ll “sing praises to the LORD!” (Psalm 150:6) Will you? Even if you are on your death bed, if you still have breath in your lungs and a beat in your heart, God has you here for a reason. Find it. Live it. Gotta Get Outa The Way! Are you struggling to overcome something today? Are you tired and weary? Is it not working out for you like you’d hoped? Does it feel like you take a step forward one day, just to fall back three the next? You’re not alone. We died to this life. “It is no longer I who live, but Christ who lives within me.” (Gal 2:20). Believers, we’re dead. D.E.A.D. Dead. That’s pretty clear. If I’m dead, who’s walking around in this body of mine? Who’s writing this note? Who’s reading it? Who’s drinking this cup of coffee? Who’s going to work in 20 minutes? Christ living in our body…In my life, and in yours. We are raised to walk a new life. A new life in Christ. Where we go, He goes. What we do, He does. What we say, He says. The people we interact with every day know who Christ is by our life…Our actions. Our inaction. Our attitudes. Our words. That’s a really big responsibility. I’ve been struggling for years to put my old self aside, especially at work with my language and speech. That opening passage of Colossians 3 really jumped off the page right at me this morning. In prayer, this is what God whispered to me. You are struggling to overcome something too. Stop struggling. Step aside and let God do what only He can do! Will you join me in getting out of His way so He can change our lives? I’m praying for you this morning.